The Goblin - ZineWiki - the history and culture of zines, independent media and the small press. 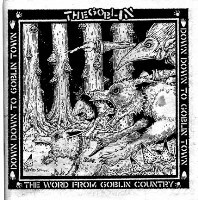 The Goblin is a punk zine, originally published in Oakland, California in 2004 by Goblinko and produced by Sean "Goblin" Aaberg. The zine is a sequel to Sean's zine Binocular Rebellious and is intended to be a continuing publication. Clint Marsh of Wonderella described The Goblin as follows. "Sean treads some of the same paths this time around, leading us deeper down, down, into Goblin Town, a place that used to look a lot like America but is now an overgrown punk-rock European forest brimming with possibility and free will. Obtain this key and the kingdom shall be yours." Christine Boarts-Larson of Slug & Lettuce described The Goblin as follows. "The first half of this is a thoughtful reflection on Sean's life of punk rock in Oakland, full of critical observations and thoughts. While many of us have read this sort of thing before, and it's usually either tinged with nostalgic "things were so good then", or "how dumb i was and now i know better" attitudes, this is more of a criticism of the good and bad angles, which includes criticism of himself. It is so well written and honestly seen, that it is really one of the best critiques of this sort that i have read; the sort that kids in college writing their thesis on punk rock wish they could have written. And while Sean is cynical and critical, and tears into trends, people and the time by calling a spade a spade - there is still a refreshing level of upbeat positivity, or should i say hopefulness of seeing beyond the trappings of the trends, culture and commodification of both punk, liberalism and the East Bay." The Goblin describes itself in its own introduction. "The Goblin is about redefining things that have been co-opted by maniacal political concerns, so that words aren't so loaded, and the reactionary way society wants us to be dissolves. The Goblin is about being out in the countryside with a beer and a friend and just enjoying yourself." The Goblin pushes for a Rustic Dynamism and Resurgent Atavism through a new folk culture. The Goblin was reviewed by Joe Biel in the 2004 issue of Best Zine Ever. This page was last modified on 5 November 2007, at 02:39.